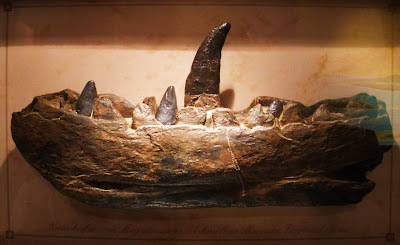 Lower jaw of Megalosaurus bucklandii, copyright Ghedoghedo. The Megalosauroidea is a clade of large theropods known from the Middle Jurassic (Aalenian) to the mid-Cretaceous (Cenomanian) (Holtz et al. 2004). In some references this clade is referred to as the Spinosauroidea but the name Megalosauroidea has priority. Megalosaurus bucklandii from the Middle Jurassic of England was one of the first fossil dinosaurs recognised; many other predatory theropods have been subsequently referred to this genus but most (if not all) are currently agreed to be either misplaced or not diagnostic. Synapomorphies (from Holtz et al. 2004, as Spinosauroidea): Premaxillary body rostral to external nares longer than portion of body ventral to nares, angle between rostral margin and alveolar margin less than 70°; maxila rostral ramus present, rostrocaudally as long or longer than dorsoventrally; lacrimal rostral ramus dorsoventrally pinched and narrow; deltopectoral crest greater than 45% of humerus length, well developed; humerus with well-developed olecranon fossa on caudal face of distal end. [AC02] Allain, R., & D. J. Chure. 2002. Poekilopleuron bucklandii, the theropod dinosaur from the Middle Jurassic (Bathonian) of Normandy. Palaeontology 45 (6): 1107–1121. [B08] Benson, R. B. J. 2008. A redescription of 'Megalosaurus' hesperis (Dinosauria, Theropoda) from the Inferior Oolite (Bajocian, Middle Jurassic) of Dorset, United Kingdom. Zootaxa 1931: 57–67.